The Holy Spirit is the third person of the Trinity. God is a Trinity. There is the Father, the Son and the Holy Spirit. 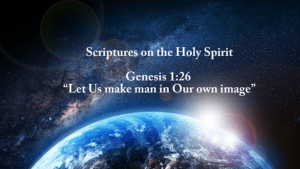 When God created man He said in Genesis 1:26 “Let US make man in our own image”. There are so many scriptures on the Holy Spirit in the bible and we wanted to share a few of them with you. These are not all the Holy Spirit scriptures but just a few that we thought you would enjoy. Do you have a favorite scripture about the Holy Spirit? Share it with us below in the comments. Thank you I read all the scripture verses an it made a big impact to my spirit. Thanks again, keep praying for me as I for you. Let us keep praying for love to reign over the world in each mans heart.